So, I'm looking to filter my brew in a new method. Til now, I've used additives with poor results; poor results meaning I've had to pitch whatever I ended up putting additives in because it never settled out to my liking. On this list include the usual heavy hitters of bentonite (the speedy variety) and chitosan. , I'd like to try and use a more "mechanical" approach to filtering. Problem is, I can't seem to find somewhere that lets me buy the filters he used in quantities of less than 1000. So, I'm off to find another way. Right now I'm kicking around the idea of a 1000+ thread count organic cotton pillow case. A friend of mine also suggested flour sack towels. What say you, oh community of rice brewers? 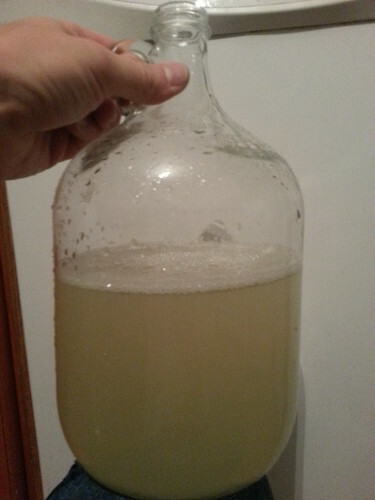 Have any of you had good success filtering your sake through a medium that can be easily come by and re-used? 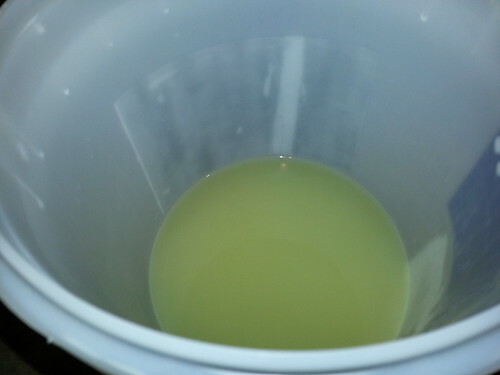 If it's not crystal clear at the start just pour that sake back in the filter again, and don't squeeze, be patient. 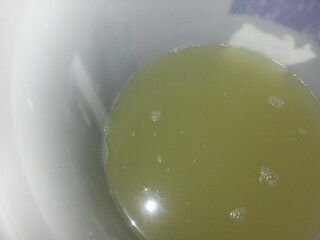 The sake taste cleaner to me without the bentonite. All in all I don't think it went well. The filter components and paper filters came from William's Brewing. 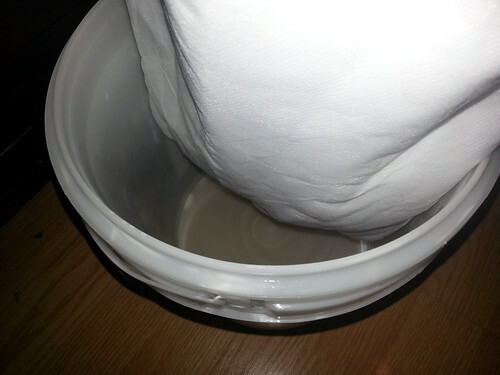 Soup, I can gladly detail a working method to clearing sake with filter bags, just message me. Why not detail it here where it contributes to the community? Oh, right. Will Auld. :? I am also looking to find something that works for filtering. I have tried squeezing with paint strainer bags. worked. not totally happy with the results. I now have a press and am going to try and assemble some bags to use as well. If I can find some plain heavy duty cotton that is unbleached i will be on my way. did a test press last night with the fruit press and just paint strainer bags. the success was measured by the amount of work we had to do. Which was very little. fill the bags and press away. now to find the right material for a bag. OK, so it's been done for a short while now, but I have been a bit too busy to write a proper write up; let me try and rectify that. I did end up pressing this batch with a hanging bag type of setup, however, I did NOT use a filter from a manufacturer or other source. 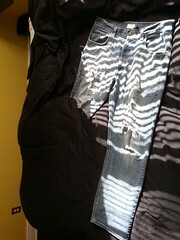 I tried to go DIY, and used jeans, as suggested in passing by trex66. Note the coloring (no flash used), as to compare later. 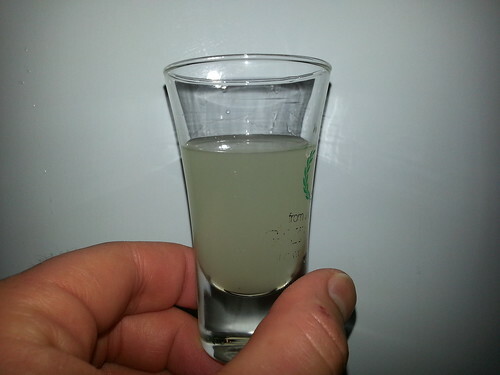 Incidentally, this portion turned out a lovely smooth batch, well received by friends, neighbors, coworkers, barkeeps and myself. Do note, that despite what the bucket says, my sake DOES NOT taste like donuts... Yet. The texture and viscosity was somewhere around regular yogurt. I imagine I could have squeezed more, but, it wouldn't have mattered, as I will explain later. So... here are my thoughts on the final product. As you may have already distinguished, there is a slight greenish hue to the filtered stuff (amplified with a flash), which mostly settled out. The filtered stuff is also a bit paler and clearer. The big important difference is the taste; this stuff tastes like my regular brew, with the addition of blue jeans. Yes, IT ACTUALLY TASTES LIKE BLUE JEANS. Needles to say, my choice of filter was a big mistake, and I won't be using the same material again. I wish I had stuck with my initial thought to track down some heavy weave and/or high thread count organic unbleached cotton. As it is, this stuff is undrinkable to me. I may try and use it to make shōchū, along with my leftover solids from the 1st racking (into primaries), but that remains to be seen. Amazing post, man. I love the pictures! Too bad about the blue-jeans flavored sake, though. Nice pictures - was a good read/view. What did you get, and where did it come from (link if possible)? Well, I finally got around to biting the bullet, and I ordered a filter from filtersource to fine out my settled lees. I'm wondering how reusable this thing is, if even at all. It's made of a fine poly mesh, and although I haven't tried it yet, I image this would be near impossible to thoroughly clean out and use again later. Adding another $20 a batch isn't really the direction I want to go with brewing. 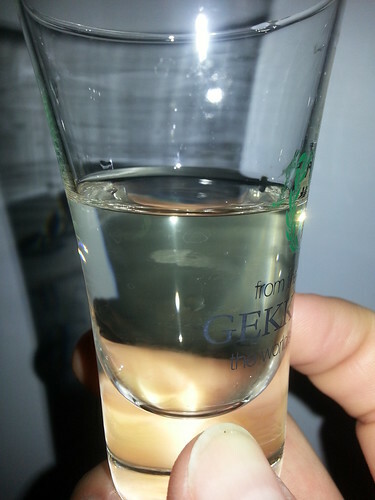 Well, I'm finally getting around to posting the notes and pictures from using the filter I purchased (see previous post) to press (hang and drip, more accurately) my sake. 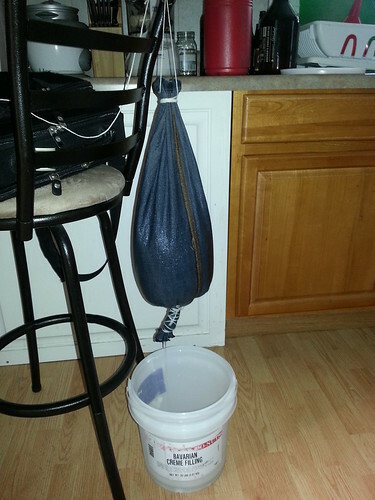 So, I filled the bag, and hung it by its handles over a bucket (pretty easy), then set the lid on top. 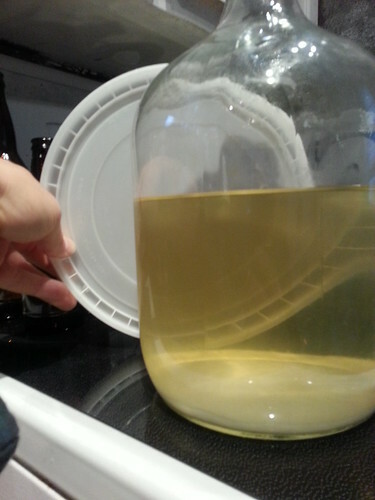 I only had about 1/2-1/4 of a gallon of lees left on the bottom of this particular carboy, so there wasn't a ton of pressure to let gravity do most of the work. 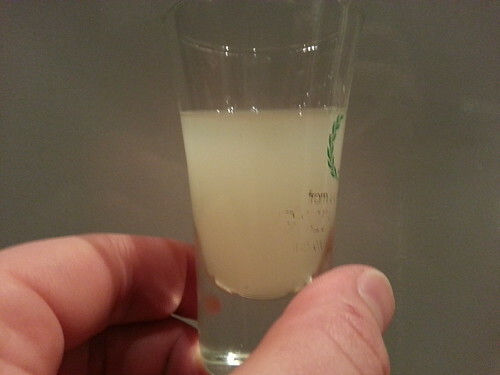 The little bit that did run off immediately was fairly clear (not as clear as the infamous-jean sake above, but also not green and funny tasting). After an hour or so, I commenced squeezing, and eventually wringing the bag. I yielded about 3/4 of a growler, and the cloudiness looked like so (flash, no flash). The real drawback to this filter is such: there is no conceivable way from me to thoroughly clean and sanitize it. 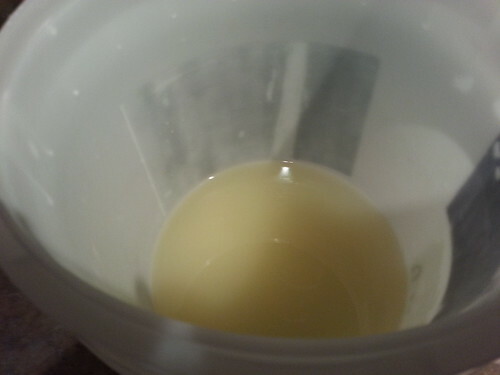 I rinsed it, a few times, and soaked it, a few more, and then rinsed again. While the water ran clear, the smell of sake was still very present. I've decided to freeze the bag, and sanitize it again (hot water first, sanitizer second) for the next time I use it. If you needed to do a big run, there are bigger sizes available (I got the 7"x16"), but I still think the same problem would be how to clean it afterward. Perhaps some kind of high pressure back-flush, but I'm obviously not equipped for that. I know this is an older thread, but hopefully this addition will help someone looking to filter their sake. Researching and viewing hundreds of sake-kura photos and videos I noticed that the old sake filter bags were nothing more than burlap-canvas bags. (Not that coarse burlap we used for feed bags, but what we called canvas on the farm.) Anyway, I made my own bags for sake and it filtered great, clean, clear. Get some unbleached burlap/canvas(Fabric store labels it burlap, 40 needle fabric. Looks like unbleached canvas for a shopping bag.) Wash before cutting & sewing. Cut the canvas to just over double the width of your intended filter bag, fold over and stitch the edge of the tube. Fold over that seam and stitch one more time. Stitch the ends of the bags the same way. I split my tube into 2 separate bags, each about 8-10" wide and 18" long. 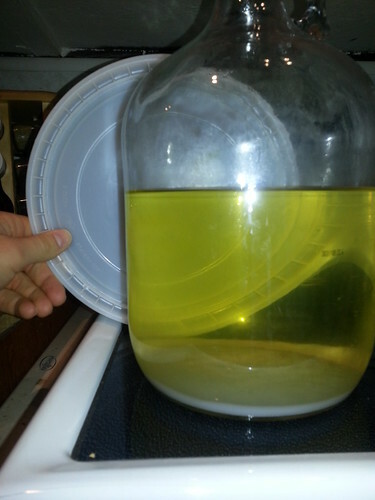 Wet the clean bags in boiled water, and allow to cool a couple minutes in a sanitized environment - I use a sanitized dishwasher rack. This will swell the cotton fibers creating a very fine filter matrix. With the stitching on the outside of the bag fill it with your moromi mixture, leaving enough room to tie it closed. After 3 days hanging I tried to press sake out of the bags with 200# of weight, but didn't get enough sake to make the effort worthwhile from the extra pressing. 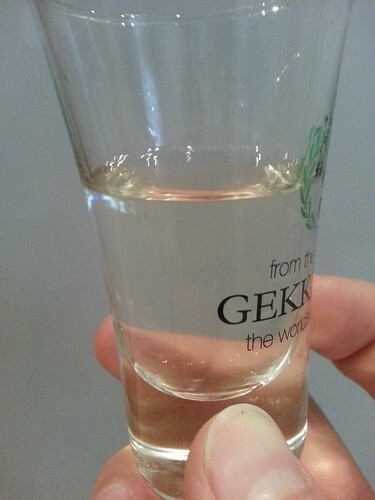 This filters very clear sake, almost no nigori or lees. The bags clean up easily for repeated use. Also no need for bentonite clay or other additives that may effect flavors. I definitely need to find some canvas to make those filter bags. Looking into figuring out a way to hang the lees, but inside an inverted bucket so I can minimize air contact. I picked up my fabric at Joanne Fabric Stores, so any fabric place will likely have some for you. For hanging I used a hallway closet since I don't have a brew refrigerator. I surrounded the setup with reflective insulation and kept throwing ice packs around the bottom container to keep it moderately cooler. Tie the bags to the hanging rod there. 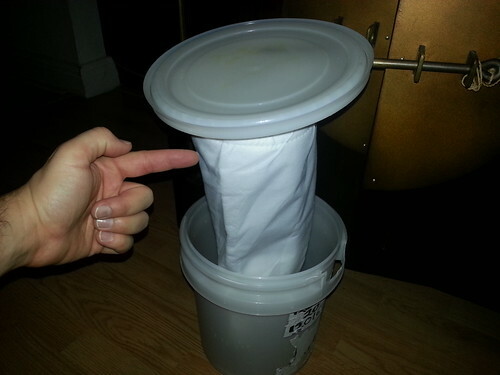 Put a large pot in the bottom with the bags suspended just inside, and you could use a bucket if that's better. If you want a "cover" for the bags then you might try a clean plastic bag or even a clean trash bag? Run the support/hanging rope through the bag and let the bag cover everything up. 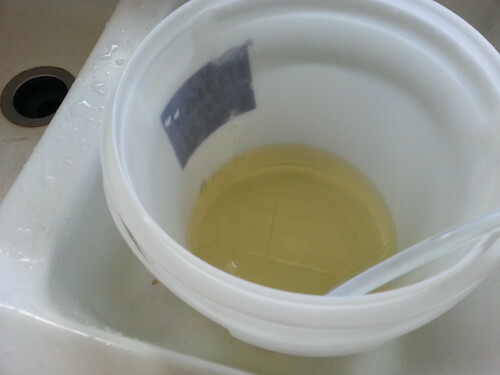 For the catch container, it was sufficiently large enough that I could get my siphon pump in there and pump it clear every 2-3 hours during the day and first thing in the mornings. 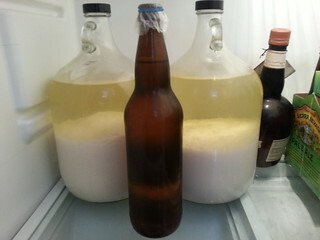 Transferred the drippings to a gallon fermenter in the refrigerator at that point. 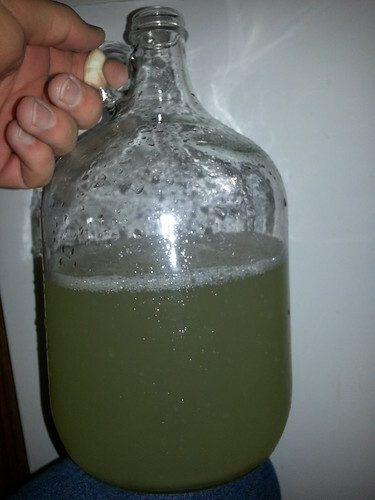 One fun thing has been putting all the leftover lees in one of the bags, putting that in a container in the refrigerator and getting a daily sip of fresh drippings. Not getting much anymore, but for a while I was getting about 50ml, then down to 30ml and now probably only about 20ml per day. Of course I have less lees now as I'm making some pickles and amazake with it. Just wish I had a brewing refrigerator so I could start another batch... Never enough time or toys! 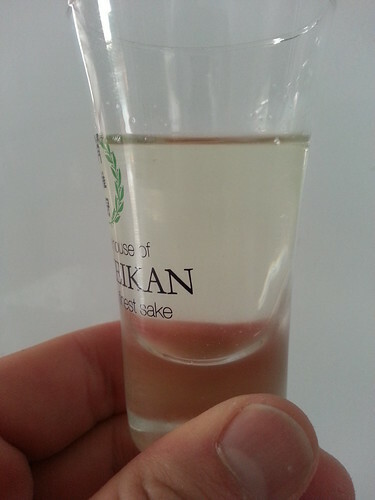 I'm planning my first batch of sake and looking for a good way to filter without having to do subsequent finings. Does filling and hanging canvas/burlap bags still seem like a good approach? FWIW, I have a refrigerator available for this activity. Yes, go to the fabric store, buy regular off-white, non-bleached canvas. About the same density as jeans. Sew up the edges, fold over and sew again. Go slow for the sake of your sewing machine. That will make a good seal. 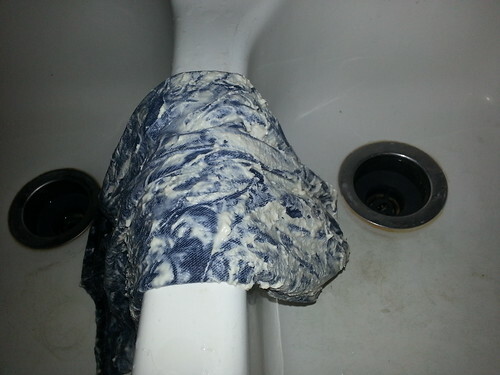 When canvas gets wet the cotton material swells and makes a nearly water-tight seal. 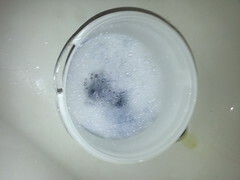 (I pre-wet my bags in boiling water so I don't soak up too much sake.) This will filter out all of the "ori"/"kasu"/"lees" from the sake. Don't squeeze your canvas bags as that will open up the pores and they'll let out more ori. Be patient and let it drip! Especially if you have a cold environment this should go well. Siphon off the drippings and transferring to bottles as you go will help keep oxidation to a minimum. For re-using the bags you'll want to wash them with detergent 2-3 times, then run them through a long soak and plain water wash several times over. I can't recommend enough washing - some people run them through dozens of washes. Give them a good boiling bath somewhere along the way. Sake picks up any subtle flavors left in those used bags, so be careful. 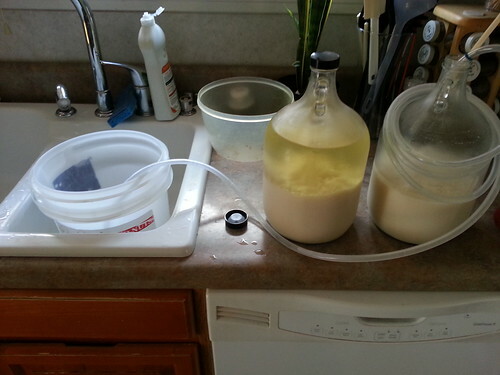 Using these bags there's no need for a second filtration at all, or for racking really. With the last of your drained sake-kasu or lees put them all in the same canvas bag, put that in a container in the refrigerator with something plastic to hold it off the bottom of the container. You'll get drippings for the next month or more, and they are lovely! I had notes of pineapple, pear, citrus and other fruits in mine. With the leftover kasu you can also make pickles if you lookup recipes for "kasu-zuke", by just adding sugar and salt then some carrots or other veggies to the mix. Also there are recipes for "ama-sake" that use the kasu with added water, sugar, ginger and a little blending for a refreshing drink. I'm in Japan now, so legally I can't make sake anymore.... Sad... But I work at a high end sake bar now and am studying for my Sake-Sommelier certification currently. Still in touch with some sake brewery professionals, so I'm learning a bit more about the professional side of things.